Jessica Kraft Miguel Robles, Marcia Ishii-Eiteman, and Rachel Pachivas. If you were to take an inventory of the genetically modified organisms in your life, you could start with your breakfast cornflakes. Nearly all non-organic corn in the US is genetically engineered, meaning that it has been bred with the genes from bacteria that act like a pesticide or with genes that protect the corn plant from toxic herbicides. Pull on your favorite T-shirt. Chances are that you've just swathed yourself in genetically engineered cotton, which may have originated in India's "Suicide Belt" — the cotton-farming region in which subsistence farmers are getting trapped in a cycle of debt and shame stemming from their adoption of genetically modified cotton seed. Say you hit a Mexican place for lunch and order some fresh tamales — guaranteed to give you another dose of genetically engineered corn — and get a takeout Chinese dinner, mostly fried in canola oil and dressed with soy sauce (nearly 90 percent of canola and soy crops in North America are genetically engineered). Your body would then become a 24-hour processing plant for a grand, uncontrolled experiment that enriches the coffers of chemical companies, destroys farmland, and may be giving you new allergies, weakening your immune system, and disrupting your hormones. By injecting the DNA from one organism into the permanent genetic code of another, biotechnologists are engineering a number of plants and animals that transcend evolution. Potatoes with bacteria genes, pigs with human growth genes, even tomatoes with flounder genes — all these creations are intended to make food more appealing and less energy-intensive to produce, but they can have unintended negative effects. Why didn't you know any of this? Because American manufacturers are not required to label their GMO products. But there is a movement afoot to demand the labeling of GMOs in the United States. Over the past decade, similar measures have been passed in fifty other countries, including every European nation. A partnership of nonprofits and businesses, lead by the Center for Food Safety, is pressing the federal government to thoroughly test, label, and regulate genetically modified foods, and they've already mounted campaigns that temporarily halted GMO proliferation in alfalfa and beets. These organizations would like to see genetically modified food go the way of MSG, transfats, and high fructose corn syrup. But they're up against formidable opposition. The biotech industry spends $510 million a year on lobbying, so the key to a successful fight is to mobilize consumers to choose organic foods and demand labeling of GMOs. Chemical companies such as Monsanto, Syngenta, and Dow that develop, test, and then sell genetically engineered seeds claim that their products deliver increased yields, require less petroleum-derived pesticides, and are the answer to the global hunger problem. They also say genetically engineered food is safe. Yet multiple third-party studies have shown that these claims are greatly exaggerated, if not false. The Union of Concerned Scientists, the United States Department of Agriculture, and Navdanya, a consortium of global nongovernmental organizations, have all released recent reports that show that most genetically engineered crops do not provide increased yields, and actually require even more energy and inputs to farm than conventional crops. Miguel Altieri, associate professor of agroecology at UC Berkeley, says the companies' claims of addressing global hunger are wrong. "None of the GMO crops are going to hungry populations — they are either used for animal feed or they're going to China and Japan in the form of soy products," he explained. The environmental issues stemming from GMO crops are reaching troubling proportions. Transgenic Monsanto corn crops must be sprayed with Monsanto's Roundup herbicide, which kills competing plants, but not the corn. In just a few seasons, "superweeds" develop that are more resistant to Roundup, and therefore much more difficult to remove. The United States now has 12 million acres of farmland infested with super weeds. And millions of gallons of highly toxic Roundup have been poured onto the land and into our waterways. Health effects have been harder to document, but studies on GMO-fed lab rats show serious reproductive health effects: infertility, fewer offspring, and increased newborn mortality. Other studies point to kidney and digestive system damage and the persistence of bacterial toxins from GMOs in the bloodstream of pregnant women and infants. Fairfax-based pediatrician Michelle Perro is convinced that ingesting genetically engineered food can cause permeability in the intestines and may be linked to increasing rates of autism spectrum disorder, allergies, and hormonal problems. "I am seeing a rise in a multitude of illnesses in children that I never saw in the past," she said. "I caution parents that even though we may not have a direct correlation to GMOs, if you think they may be the cause of your child's illness, then stop eating them." Certain communities may be more at risk because of the concentration of GMOs in their cuisine. Miguel Robles, an activist with the California Biosafety Alliance, believes that more needs to be done to raise awareness among Latinos about the risks of genetically engineered corn. "Latinos are more affected because pupusas, tortillas, and tamales are all made with corn, and all corn is GMO in the US," he said. "There is no widespread movement yet because the nonprofits have all the info collected on their computers and not in the grassroots." But a grassroots movement seems to be growing now. Since September, there have been a dozen or so events across the Bay Area aimed at mobilizing groups to take action on GMOs. Like many other progressive causes, the GMO activists are linking their message with the democratic ethos of the Occupy Wall Street movement. 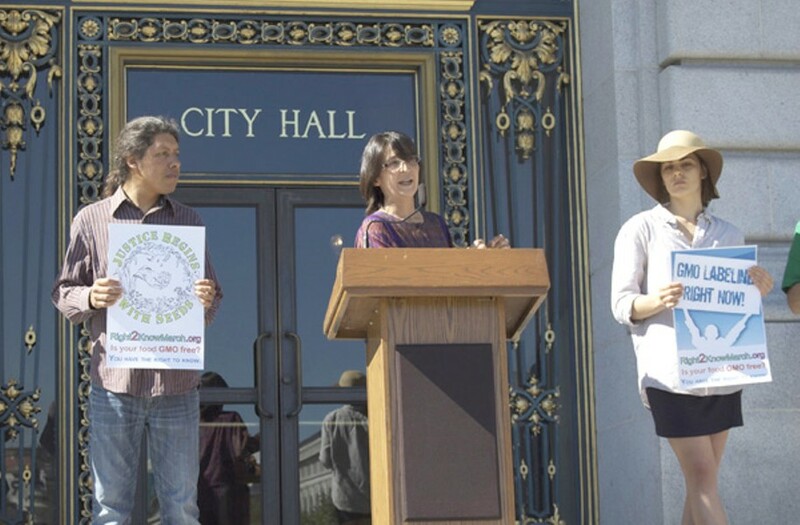 Karen Swift, the founder of the California Biosafety Alliance, told a rally at San Francisco City Hall on October 13: "Food transparency is even more basic than banking transparency. We have a right to know what's in our food." Berkeley biologist Ignacio Chapela used the technique of the people's microphone to tell a GMO teach-in audience: "It's time to occupy the food system!"